Parked! Sometimes after a week of straight snow you appreciate the little things. Finally reaching the skiing promised land after a blower commute. Greatness comes in so many forms but this weekend was certainly filled with greatness of fresh snow and friends. Simple forms without lines and traffic jams. Today’s line of sight was well, short. The riding however wasn’t short, 8 hours straight trail break mashing. Hell it made sense to get stuck because you could actually take a pee, the 686 one piece suit made that very easy. With the tight tree spacing and 8-10 foot dune walls around every corner, the margin of error was slim. If you can’t go around it, then hang a leg off and drive through it. The easiest form of landscaping actually and no better crew than Josh Bremer , Jake Sims and ‘Greg Wells’. Wish we had more pictures but there really wasn’t a place to stop for the opportunity, now I realize why dolphins have so much fun. Thankfully 686 makes bright zippers, otherwise we probably could find her. Lots of mechanics could out of the tool box on deep days like yesterday; Geneva found those skills but also packed away a few new ones. Based on body language and high severity face shots; safe to say she’s hooked. Alex Dorszynski with a pinky up drinking the goods in Tahoe. It’s been quite a tear out there this spring, snowpack looking healthy for a change. La Niña taking it’s late season till like usual. 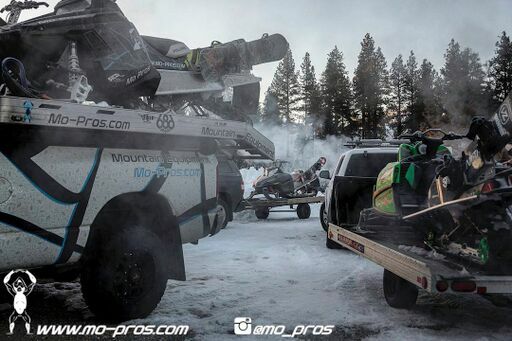 Team Rider Frederick norquist getting gnar on his @skidooofficial 850 dreamer. Roost city baby. When Bae is cold and mo-pros racks are life. Team Rider Matt Belzile always taking care of the backcountry scene. Girl Crew. Amy David grew up in Wyoming, riding horses into her young adult life below the Tetons on her uncles ranch. Now she’s riding 160 horses simultaneously with full control of this bucking bronco. 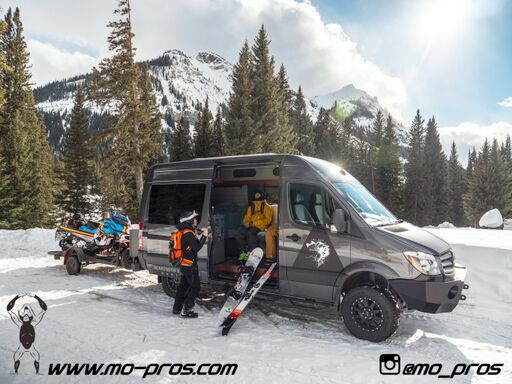 Under the leadership of Jeremy lato, Amy has great insight into the things ahead of her and how to be prepared, safe, and functionally use that @polarissnow as a functional tool for accessing ski terrain. With daily classes in sled school, we’re excited to see this horse join the rest in the pasture. Laps on laps with more laps. Strong crew yesterday with an agenda. Christmas gifts have lost allure, you can’t fit that under a tree, the glass overflows. Mountain Partying. Around these parts we slap our own bags of wine. Okay okay. You get that one if I get this one. Illustrating text book breathing and Jerry free line selecting. There’s no hurry here. Team Rider Corey Seemann takes sled access skiing/snowboarding seriously. In the 2017/2018 season this mad man spent countless nights in abandoned lots and backcountry camp missions in his Teepee tent. Hauling all his supplies and wood burning stove is his Mo Pros Rack. His missions scattered across the North American continent and even spent a little time in his home town with Beartooth Vanworks . We’re incredibly proud of Corey for a multitude of reasons and looking forward to more from this guy this coming season. Throw back to this beauty who never leaves me stranded. Looking forward to podcasts and long drives. Anyways if you do the math a sled weighs 600 lbs and trailer is maybe half that, which means you could tow a sled behind a cutlass Buick supreme if you wanted to. Crazy part is when you hit snow you just hop on your sled! The truck though, which is what we were talking about, was a purchase because we couldn’t camp and get our stuff dry in the northwest. Just too much wet snow and humidity in the air to dry anything. So that’s when we went to truck campers ‘tiny homes’ and spent every waking minute at a resort parking lot snowboarding or staging area sledding. We miss the Volvo and it was a hell of a lot more comfortable; but now that we have a truck you kind of gotta ‘shake what your momma gave ya’ even if you had to buy the truck yourself. This is the kind of work commuting back up we look for. We spent a week with the 686 crew for the Rabbit Hole movie which is coming out this month. Thankfully Brad Andrew was able to provide this photo but also his cabin. The cabin is available to anyone who wants it; total open door policy. The address is 327 Admiral Way In Twisp Washington. There’s hookup for campers and a key for the house located behind the left post in a fake plastic rock. Thanks Brad Andrew for always being a contributing citizen to pow enthusiasts everywhere. Oddly enough my meal choice would be the same. Soon enough we’ll be perched up taking in what light the sun has to offer, hours before anyone thinks of getting to a resort and hours after the last soul leaves. The joy and serenity a simple headlamp can bring and how it’s powerful enough to unbridle you from the societal normality framework others are on. At this juncture we’re perplexed on what to be excited about, lately it’s been about getting back to the crew and enjoying moments like this within our backcountry family. Friends of CAIC on patrol with the mo pros rack systems. 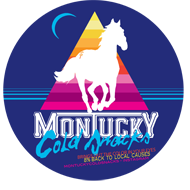 Don’t forget about your local avalanche center fundraisers happening locally near you. 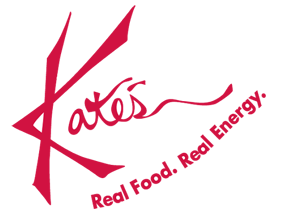 These guys depend on your support to keep them going and also raffle off some killer stuff to fund raise. Go have some drinks and push those dollars to a good cause! After all, you’re going to check their reports all season across various states. Cold and snowy can come anytime. Trent Bona uses the Ajoosta racks to film riders in the colorado backcountry. As shown here with his skis on one side and tripod securely mounted on the other. Everything else, well that goes in the middle. 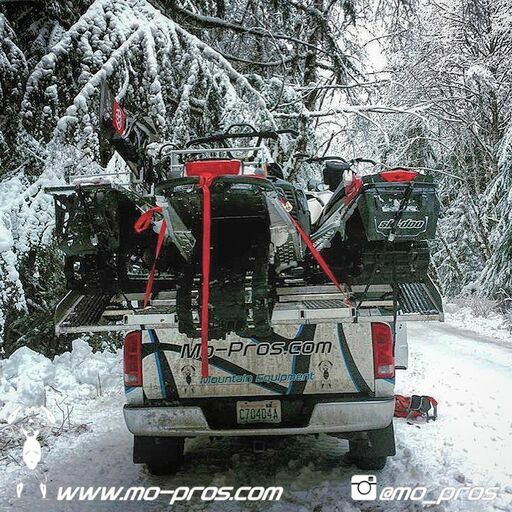 This image makes us smile because the Team on Mo Pros racks are rippers who get loose and hammer. 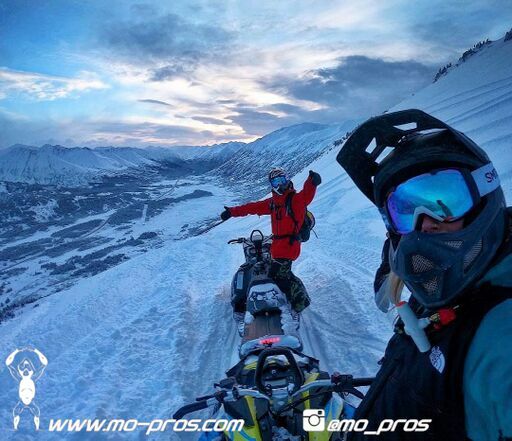 Team Rider Banks Gilberti with a confident piece of mind and getting real comfy on his ski doo 850 . This image speaks loudly to the product line. It doesn’t take long to build a secure trust with the Ajoosta racks. The capability to sled 100% when you’re sledding and ski/snowboard when you’re locked into bindings is the red line of expectations we thrive for and builds rider confidence. It’s precious cargo on board and our mission is to keep you and your equipment protected when that talent potentially runs dry.